How would one characterize the latest production from Shira Dubrovner and Mammoth Lakes Repertory Theatre? It’s an old school Saturday morning cartoon for adults. The set-up: Two renowned singing divas (played expertly by real-life divas Lisa Gill and Juliana Olinka-Jones) arrive at a posh hotel to perform at a fundraiser. The two divas are bitter rivals and are well-known to absolutely despise each other. The hotel’s General Manager, played by Stephen Gill, books each diva at opposite ends of the hotel. Problem solved, right? Wrong. Both divas believe they should have the nicest suite in the hotel. The first to arrive heads up to the suite and disappears into one bedroom. The second diva to arrive enters the same suite, and not alerted to the first diva’s arrival, takes the second bedroom. From there, doors begin flying open and shut (as well as dogs and bellhops) as the hapless General Manager tries to keep the divas from discovering each other while he desperately grasps for a solution. Wednesday’s final dress rehearsal came after nearly a week off due to snowstorms. Despite the amount of time off, cast and crew all look ready, particularly Tim Casey, who is back in his element. Casey, who plays one of the bellhops, is a terrific, physical comedian. Gill and Olinka-Jones nail their parts. 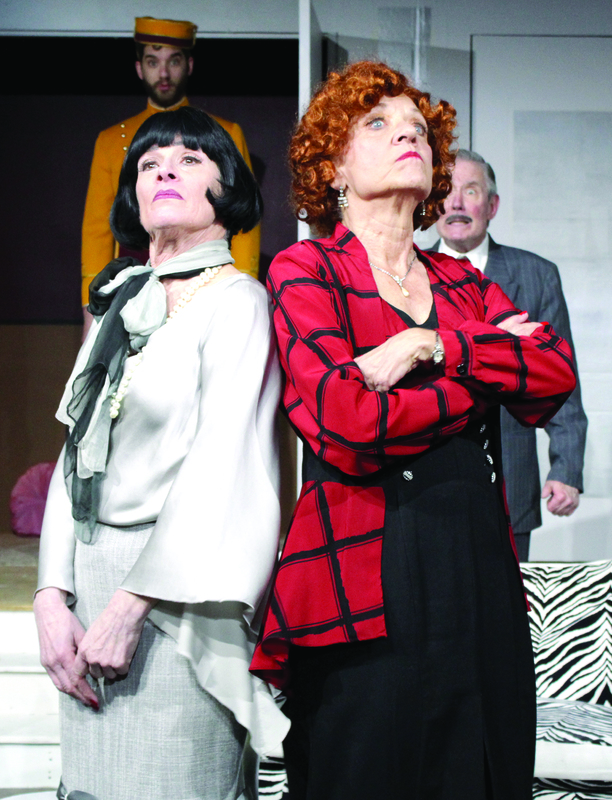 And Rhonda Duggan and Victoria Farber acquit themselves well in their local stage debuts. The show runs a fast-paced ninety minutes. There is one intermission. The show runs for the next three weekends at Mammoth’s Edison Theater (100 College Parkway). Thursday-Saturday showtimes are at 7 p.m. with Sunday matinees at 4 p.m. If you liked MLRT’s madcap 2012 production of “Lend Me A Tenor,” you’ll like “Suite Surrender” – fittingly, the posters for both shows are identical.